Is the mind keeping you busy in the night when you should get your well deserved rest? Are you unable to go back to sleep after getting up in the night? Valerian is often used for any forms of insomnia, especially anxiety-associated restlessness and psychological stress. It relaxes the mind and promotes sleep. The relaxation action of Valerian is so great that it has a calming effect on smooth muscles which explains its uses for menstrual cramps, nervous stomach, headaches and migraines. We only use herbs of pharmaceutical grade quality. We haven’t identified a need for a organic certification for our products. If we do so we will register with the Soil Association which allows us to claim “organic” origin on the label. However, our herbs are mainly sourced from organic farmers or are wild harvested from remote places. We consider sustainable wild harvesting as prime herb quality with which organic farming cannot compete with. 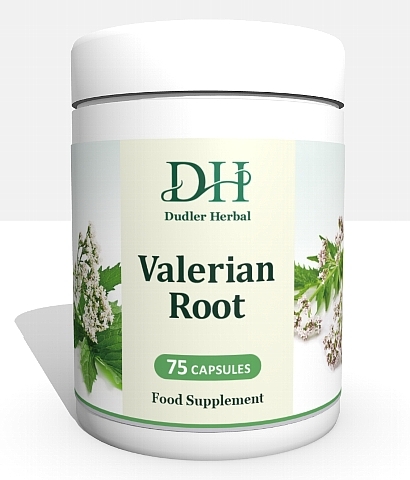 Valerian is a prime example in our repertoire of herbs which does not agree with compound isolation. Of course, there are the Valepotriates tested for anxiety, the Valerenic acid tested for insomnia, and there is the cytotoxisity activity of Baldrinal, a decomposition product of the Valepotriates. All these single isolated compounds are more or less well described in the specialised literature and they seem to promise exiting features and possibilities. Exciting they may appear, but the “real world test” they lack, unlike the whole Valerian root given as first-line remedy to many people, especially elderly, for sleeping problems.